I do most of my review listening through headphones just before bed. It’s a habit I picked up years ago that has just stuck. I find the tenuous space between wakefulness and sleep most conducive to penetrating the dark heart of a musical piece. Once in awhile, though I come across an album that sends me to the place where nightmares are made. And, like a good foreign horror film I can’t pry my eyes from I just keep listening until the screaming starts. Since their debut EP (2014’s brief but demanding Archaic), the ambiguous quartet known as Jupiterian have steadily released new and increasingly challenging material. Building upon their distinctive, fuzz laden sound through titles such as 2015’s Aphotic and last year’s Urn we are brought up to present day with the highly evolved and masterfully produced Terraforming. The overall vision and imagery of Jupiterian is quite literally veiled in shadow. Instead of keeping up with various fashion trends of the day, the Brazilian band opts instead to cloak themselves in stylized black hoods and robes. Although this isn’t an entirely new concept by any means, I strongly believe it is an integral one necessary to complete the total experience. 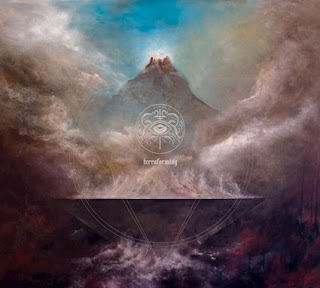 Much like viewing Terraforming’s cover art while listening to the album itself, the music takes on an even more ominous tone considering the shrouded source from whence it came. Also, the band’s conscious decision to adopt the pseudonyms V, A, R, E and G (collectively GRAVE) is worthy of note. While the album can certainly be enjoyed track by track, in order to be fully appreciated it ought to be played through in its entirety. Simply put, there are far too many hypnotic nuances throughout this work to be missed. A bleak journey into the spiraling void, Terraforming is divided into two sections: Foundation (being Side A) and Empire (being Side B). Distant, sparse percussion echoes in the damp background while an over-driven bass line drones into the opening phrases of “Matriarch”. When they do come in, the multi-layered and mesmerizing vocals despite being growled remain atypically smooth. It’s a welcome production move that ensures the general cohesiveness of the total sound. The second portion of the song is annotated by a striking snare roll that leads in to a satisfyingly stark chord progression. The guitars here are so dense and so dominant that any fan of Sunn O))) will be appeased. In keeping with its decidedly menacing theme, Terraforming drives ever onward with only the bleakest abandon. The doom-heavy “Unearthly Glow” is equal parts raw ferocity and deepest, darkest depression. Repugnant yet strangely all-encompassing, the song is vaguely reminiscent of the ambiance created by doom brethren Bell Witch. Foundation is wrapped up with “Forefathers”, a heavily distorted affair that showcases some hugely extreme vocal chops. Not since first hearing Primitive Man have I been so impressed. Essentially, this is the perfect blend of relentless gravity and unapologetic melancholia. Empire introduces us to an even moodier version of Jupiterian as the title track delves in to new depths of despair. Hanging by a thread, we are given a glimpse into what Dante may well have envisioned as his Inferno. “Us and Them” starts out cleanly enough with desperate, hollow guitar suspended precariously above a tumultuous and rhythmic undertow. It’s not long, though, before the song proper begins and the familiar aural assault continues. The third installment of Empire and the album’s closer, “Sol”, is classic doom through and through. It winds the album down gracefully and features a totally unexpected face melter of a solo. There really is no ground left uncovered on this release. I predict great things for this band. Jupiterian has all the makings of an internationally acclaimed artist and deserves nothing more than global recognition. Show them your support by purchasing their music and catching their live shows while you can. You’ll definitely be glad you did.